God is ready, willing, and able to help you fulfill your destiny in cooperation and obedience with Him in this time, regardless of your human abilities and qualifications. The exceptional nuggets of wisdom within this book will give you a startling sense of God speaking directly to you. The vibrant energy and veritable gems of truth will stop you where you are, spur you to reassess your life, and stimulate you to strive toward the higher calling that God has for you. This prayerfully and carefully picked assortment of themes will capture your heart and captivate your spirit. 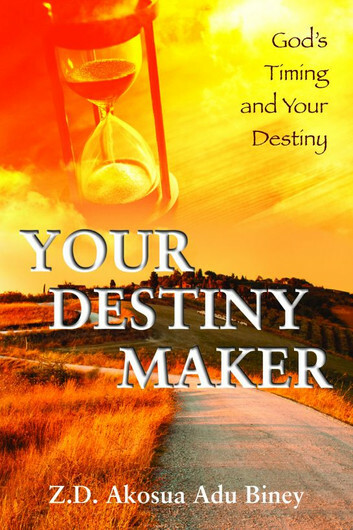 In today’s superficial world where most people depend on their own wisdom and strength, Your Destiny Maker reveals the Scriptures that ring true and pure! The powerful mystery exposed within will make your calling sure; and when the time comes, you will stand boldly before the Lord with your head lifted high to receive your crown as a good and faithful servant. Some ten years ago while living in Italy, my husband and I planned to migrate and live in the United States of America because we thought that was a better place to give our children a future. I called my elder sister who is an American citizen, and she sent me all the necessary documents. But sooner, rather than later, the desire vanished. Then some years later, I received a letter from a woman apostle in the United States who had witnessed one of my meetings and invited me to her church. Because of protocol, I left the decision in the hands of my bishop.While the woman of God pressed hard for me to come to the States, I could feel the reluctance of my bishop to agree. Although he was able to obtain a U.S. visa in a day, mine was delayed and delayed. In that same season, he took two of our pastors to the U.S., while I didn’t understand the postponement of my departure. Then a year later, my own brother, who is a pastor in the U.S., strongly pleaded with me to come to his church and hold a gospel music seminar. He sent me an invitation letter and all the required documents. I began all the necessary preparations to journey to the U.S. The day I sent in the application for an interview, that very night, I had a vision. In the vision, I was in the American embassy; and when I presented my document, I heard a man tell the woman at the counter that it was not time for me to travel to the U.S. When I came to myself, I took this message very seriously thinking that the devil wanted to hinder my journey, as he had done previously, and prayed every prayer in me to destroy the works of the devil. On the day that I was scheduled for the appointment, I put on my clerical collar, anointed my head, and prepared myself against any spiritual barrier.When I arrived at the embassy, most of the applicants drew near to me, asking me to pray for them because they were uncertain about being given a visa or not, to the glory of God. All the people I prayed for, saying let the divine will of God be done, were given a visa. This gave me great assurance that mine would be given to me in a twinkle of a second; but to my great surprise, they told me that I could not be given a visa. I immediately felt angry and uncertain and broke into tears and prayer. This was when the Lord enlightened my mind and reminded me of the vision of the embassy. He did not want me to proceed, because it was not yet His divine time for me to travel to the U.S. I then repented and thanked Him for His love. How many people wait for God’s set time for them to accomplish their desires? How many people even know that whatever we desire has a time for its fulfillment? What profit has the worker from that in which he labors? I have seen the God-given task with which the sons of men are to be occupied. He has made everything beautiful in its time.Also He has put eternity in their hearts, except that no one can find out the work that God does from beginning to end (Ecclesiastes 3:1-10). What first comes into your mind as you read through this passage from Ecclesiastes 3? My understanding is that under the sun, there are times and seasons for every work and to which every desire must be accomplished— that the months were made for seasons and seasons were made to store and release particular blessings. As the earth revolves, so seasons were made to rotate—nothing is permanent. I believe that this Scripture tells us that there are inevitable moments, seasons, changes—that space and chance are given to every work that takes place under the sun. In the New Testament, this is what apostle the Paul calls the power of change.This is why, when you work under the wrong season and in the wrong time, purpose has been marred. It is a dysfunction. The fact that you strongly desire something does not mean it is time to bring it to pass. It is God, according to Scriptures, who gives us those desires, and it is also He who determines the right time for the fulfillment of these desires. The writer of Ecclesiastes is saying that whatever you desire, will, long to do, or accomplish, and whatever is your mission here under the sun, has a determined time to do it and for it to be accepted.This is what is called the acceptable time of the Lord; after all, it is He who causes us to will and to do for His good pleasure.1 This is all part of fulfilling your destiny.